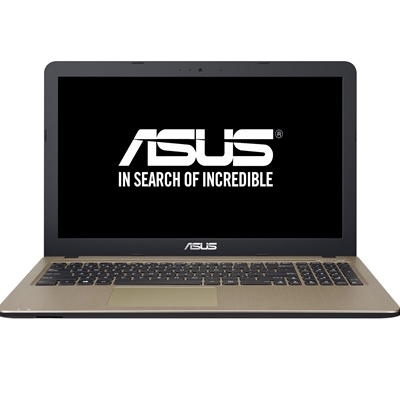 The ASUS X540 Series is powered by the Intel processors to give you smooth and responsive computing performance. With NVIDIA GeForce 900 Series discrete graphics, an advanced onboard memory controller, up to 12GB RAM, and Windows 10, X540 is an ideal daily computing platform. The new reversible USB Type-C port makes connecting devices much easier and gives you super-fast USB 3.1 Gen 1 speeds of up to 5Gbit/s so you can transfer a 2GB movie to a USB drive in less than 2 seconds! Its compact port design even helps preserve X540's thin dimensions. A mixture of hardware, software, and tuning, SonicMaster was developed with the clear goal of giving you the best notebook PC audio. A professional codec ensures precise sound performance while an optimized amplifier, larger speakers and resonance chambers deliver powerful audio output and deeper bass. Additional signal processing helps fine tune the hardware, filtering noise and improving clarity so you can enjoy unrivalled audio on your X Series. ASUS X540 has a solid and lightweight chassis that weighs just 1.9kg ideal to take with you when you're out and about. Its premium brushed finish turns heads and makes sure that you stand out from the crowd. It features four visuals modes which can be accessed with a single click. Vivid Mode optimizes contrast for browsing photos or watching videos and movies Eye Care Mode reduces blue light levels and is ideal when you're reading for long hours. Normal Mode has been tuned for daily tasks while Manual Mode is for advanced color adjustments. ASUS IceCool Technology gives X Series a unique internal design that addresses uncomfortable heating issues by preventing heat build-up under the palm rest. This keeps the palm rest surface between 28C to 35C significantly lower than body temperature. This exclusive internal layout places heat producing components away from you, and when combined with exceptional cooling from the heat pipes and vents, ensures you stay comfortable even after long hours of use.